Our Lady of Guadalupe Rose (Rosa “Our Lady of Guadalupe”) - Calibrates the unfolding of the Higher Heart chakra as it conducts higher love frequencies into your physical body. Encourages you to keep your heart and higher heart chakras open during this process. I AM conductor and regulator of love, through the heart and higher heart, as it seats into your physical form. This beautiful silvery pink rose from Jackson and Perkins Company is named for the Patron Saint of the Americas who made roses spring from the frozen soil of a mountaintop as a sign of hope for her people. As you open your heart to the Love of the Universe, you may find yourself experiencing symptoms like feeling jittery, over stimulated, or swinging between being full of energy and extremely tired. Closing down your heart and higher heart chakras against the intensity of feeling higher love energies. Our Lady of Guadalupe Rose Flower Essence operates through the Heart and Higher Heart chakras to gently calm the nervous system and facilitate the integration of higher love frequencies into your physical body at a rate that you can handle. Encourages you to keep your heart and higher heart chakras open even if the intensity of these feelings is unfamiliar or overwhelming. 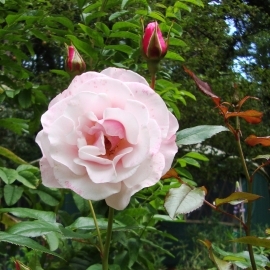 Our Lady of Guadalupe Rose Flower Essence was made by the no-pick method of working directly with the plant spirit. While the essence was being made, a matrix of amber, cherry quartz, danburite, drusy quartz, Herkimer diamond, icosahedron quartz, morganite, nirvana quartz, Peruvian pink opal, pink Lemurian seed crystal, pink tourmaline & quartz, rhodochrosite and rose quartz crystals were placed among the plants with the mother bottles. The sun acts as a transformer to step down spiritual energies from higher dimensions. While the essence was being made, Amber acted as a lens to receive and focus sunlight for this purpose. Cherry quartz instills hope and helps you to see the bigger picture. Strengthens the heart. Danburite increases communication with angels and other high frequency beings. It facilitates embodying resonance with the Divine Heart, so you may be of service by bringing this energy to the world. Drusy quartz crystals help to energize and stabilize your subtle bodies. Herkimer diamond, as a manifestation of solidified spiritual light, takes you as far as you can go toward the highest octave of Spirit while staying in your physical body on Earth. It also enhances the properties of other stones. Icosahedron cut quartz has 20 (5X4) equilateral sides. It is a bridge between the 5th Dimension - the entry into the unified Spiritual realms - and the 4 cardinal directions (N, S, E, W) on Earth. Morganite opens your heart to the level of Cosmic Love that is all around us. It strengthens the heart’s energy field and teaches protection through love instead of fear. Nirvana quartz brings your heart and mind into synergistic communication, and promotes inner silence. Attunes you to the human evolutionary process, inner radiance, and ability to overcome difficult processes with beauty and strength. Peruvian pink opal clears and calms the heart and brings a sense of peace and tranquility. Pink Lemurian seed crystal instills a gentle, loving and strong connection with the Divine Feminine through the heart chakra. Pink tourmaline & quartz activates the higher heart chakra. It is a powerful emotional cleanser and balancer, and opens your heart to love. Rhodochrosite gently aids with healing past wounds, rediscovering self-love and embracing joy with a courageous heart. Rose quartz encourages gentleness, emotional healing, and uniting with the Divine through the heart chakra; it shifts your body from a stress-based physiology to a higher frequency Love-based physiology. While this essence was being made Spirit Song coming through Diana’s voice and the sound of rattle were infused into the essence.